Wisdom 1:12-14 "Seek not death in the error of your life, neither procure ye destruction by the works of your hands. For God made not death, neither hath he pleasure in the destruction of the living. For he created all things that they might be.."
John 11:17-35 "Then when Jesus came, he found that he [Lazarus] had lain in the grave four days already...Then when Mary was come where Jesus was, and saw him, she fell down at his feet, saying unto him, Lord, if thou hadst been here, my brother had not died. When Jesus therefore saw her weeping, and the Jews also weeping which came with her, he groaned in the spirit, and was troubled. And said, Where have ye laid him? They said unto him, Lord, come and see. Jesus wept." First a definition: death is the separation of the soul from the body, a phenomenon we can't know has happened with moral certainty until corruption has begun. "Death" does not mean the cessation of breathing or heartbeat, nor does "brain death" mean that death has occured. The soul isn't "in" the heart, or "in" the lungs, or "in the brain, or "in" any particular part of the body. The treatment of the dying, the apparently dead, and their organs is goverened by this Truth. 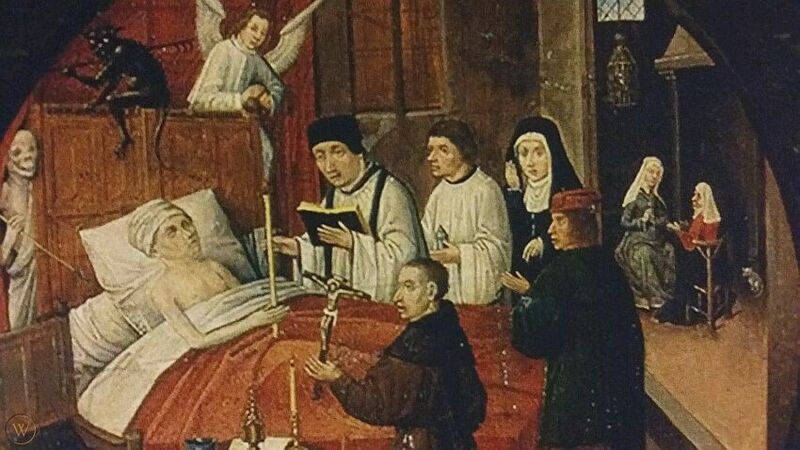 Now, a person confronting death should receive the Sacrament of Unction for the possible restoration of body (His will be done) and, most importantly, soul. This is of prime importance and should never be neglected. Other ways to help prepare the sick person for death are to pray the Holy Rosary (focusing on the Sorrowful Mysteries), the Divine Mercy Chaplet, to St. Joseph (the Patron of the dying) for a holy death, etc. -- with the sick person, if possible, or in such a manner that he can hear you. This includes audible prayer for the unconscious; never think that those who are unconscious or in a coma can't hear you! The sick person should have a Crucifix (a St. Benedict Medal Crucifix, if possible) in view, perhaps to hold if he can, and should be encouraged to offer up his sufferings and to trust in the love and mercy of our Lord Jesus Christ. A lit blessed candle, as a symbol of the sick person's Baptism -- a symbol of sanctifying grace and the promise of eternal life -- should be placed nearby so he can see the flame (unless oxygen tanks are in use, of course!). You'll note that the Catholic way of death is different from that of other "Christian" groups. We don't try to sanitize it and avoid the topic. We don't speak in euphemisms about it. We don't take salvation for granted, except the salvation of the souls of baptized children who've died before the age of reason (but we, of course, trust in the mercy of God for all others). And we don't consider it a sin or, at the least, a faux-pas to mourn. While we don't exactly "sit shiva," we don't see jumping up and down and singing happy songs as the natural reaction to having to miss someone until one's own death. In other words, it's OK to rend garments and weep; these things are not expressions of a "lack of faith," but are normal, natural reactions to the evil of death, and to missing someone and realizing that it will be some time before you see him again, Deo volente. It must be remembered that sickness and death are great, great evils; they were not "supposed" to be a part of this world, and came about as a consequence of the sin of Adam. Christ, of course, conquered the tomb and gives us the hope of eternal life. Catholics, then, look at death for what it is -- an evil -- but cling to the hope He offers, trusting in His Divine Mercy while also realizing that He is Just. Christ Himself wept before the dead Lazarus. Now, the sick person shouldn't be denied the Truth of his situation any more than those around him should lie to themselves. It is not a loving act to ignore reality out of fear of not wanting to alarm the sick one, and to do so is to imperil his everlasting soul. The dying person needs to face his mortality, to repent, to pray, to receive Unction, to be encouraged to trust totally in Jesus and His forgiveness and love, etc. He must spiritually prepare himself for judgement, and to help him do this is the single greatest act of love you can offer. Into Thy hands, Lord, I commend my spirit. and receive me at the hour of death. It is recommended, too, to read the 18th and 19th chapters of the Gospel according to St. John to the dying, helping him to focus on Christ. Go forth, O Christian soul, ouf of this world, in the Name of God the Father almighty, Who created you; in the Name of Jesus Christ, the Son of the living God, Who suffered for you; in the Name of the Holy Ghost, Who sanctified you, in the name of the holy and glorious Mary, Virgin and Mother of God; in the name of the angels, archangels, thrones and dominions, cherubim and seraphim; in the name of the patriarchs and prophets, of the holy apostles and evangelists, of the holy martyrs, confessors, monks and hermits, of the holy virgins, and of all the saints of God; may your place be this day in peace, and your abode in Holy Sion. Through Christ our Lord. Amen. O merciful and gracious God, O God, according to the multitude of Thy mercies Thou blotteth out the sins of such as repent, and graciously remit the guilt of their past offenses, mercifully regard this Thy servant (handmaid) N.____ and grant him (her) a full discharge from all his (her) sins, who with a contrite heart most earnestly begs it of Thee. Renew, O merciful Father, whatever has been vitiated in him (her) by human frailty, or by the frauds and deceits of the enemy: and associate him (her) as a member of redemption to the unity of the body of the Church. Have compassion, Lord, on his (her) sighs, have compassion on his (her) tears; and admit him (her), who has no hope but in Thy mercy, to the sacrament of Thy reconciliation. Through Christ our Lord. Amen. I commend you, dear Brother (Sister), to the almighty God, and consign you to the care of Him, whose creature you are, that, when you shall have paid the debt of all mankind by death, you may return to thy Maker, Who formed you from the dust of the earth. When, therefore, your soul shall depart from your body, may the resplendent multitude of the angels meet you: may the court of the apostles receive you: may the triumphant army of glorious martyrs come out to welcome you: may the splendid company of confessors clad in their white robes encompass you: may the choir of joyful virgins reeceive you: and may you meet with a blessed repose in the bosom of the patriarchs. May St. Joseph, the most sweet Patron of the dying, comfort you with a great hope. May Mary, the holy Mother of God, lovingly cast upon you her eyes of mercy. May Jesus Christ appear to you with a mild and joyful countenance, and appoint you a place among those who are to stand before Him for ever. May you be a stranger to all that is punished with darkness, chastised with flames, and condemned to torments. May the most wicked enemy, with all his evil spirits, be forced to give way: may he tremble at your approach in the company of angels, and with confusion fly away into the vast chaos of eternal night. Let God arise and His enemies be dispersed,, and let them that hate Him fly before His Face, let themm vanish like smoke; and as wax that melts before the fire, so let sinners perish in the sight of God; but may the just rejoice and be happy in His presence. May then all the legions of Hell be connfounded and put to shame; and may none of the ministers of Satan dare to stop you in your way. May Christ deliver you from torments, Who was crucified for you.. May He deliver you from eternal death, Who vouchsafed to die for you. May Jesus Christ the Son of the living God place you in the ever-verdant lawns of His Paradise; and may He, the true Shepherd, acknowledge you for one of His flock. May He absolve you from all your sins, and place you at His right hand in the midst of His elect. May you see your Redeemer face to face, and standing always in His presence, behold with happy eyes the most clear Truth. And may you be placed among the company of the blessed and enjoy the sweetness of the contemplation of your God for ever. Amen. Receive, Lord, Thy servant (handmaid) into the place of salvation, which he (she) hopes to obtain through Thy mercy. Deliver, Lord, the soul of Thy servant (handmaid) from all danger of Hell; and from all pain and tribulation. Deliver, Lord, the soul of Thy servant (handmaid) as Thou didst deliver Enoch and Elias from the common death of the world. Deliver, Lord, the soul of Thy servant (handmaid), as Thou didst deliver Abraham from the midst of the Chaldeans. Deliver, Lord, the soul of Thy servant (handmaid), as Thou didst deliver Job from all his afflictions. Deliver, Lord, the soul of Thy servant (handmaid), as Thou didst deliver Isaac from being sacrificed by his father. Deliver, Lord, the soul of Thy servant (handmaid), as Thou didst deliver Lot from being destroyed in the flames of Sodom. Deliver, Lord, the soul of Thy servant (handmaid), as Thou didst deliver Moses from the hands of the Pharaoh, King of Egypt. Deliver, Lord, the soul of Thy servant, as Thou didst deliver the three children from the fiery furnace, and from the hands of an unmerciful king. Deliver, Lord, the soul of Thy servant (handmaid), as Thou didst deliver Susanna from her false accusers. Deliver, Lord, the soul of Thy servant (handmaid), as Thou didst deliver David from the hands of Saul and Goliath. Deliver, Lord, the soul of Thy servant (handmaid), as Thou didst deliver Peter and Paul out of prison. And as Thou didst deliver that blessed virgin and martyr, Saint Thecla, from three most cruel torments, so be pleased to deliver the soul of this Thy servant, and bring it to the participation of Thy Heavenly joys. We commend to Thee, Lord, the soul of Thy servant (handmaid) N.____, and we pray Thee, Lord Jesus Christ, the Savior of the world, that as in mercy to him (her) Thou becamest man, so now Thou would be pleased to admit him (her) to the bosom of Thy patriarchs. Remember, Lord, he (she) is Thy creature, not made by strange gods, but by Thee, the only living and true God; for there is no other but Thee, and none can equal Thy work. Let his (her) soul rejoice in Thy presence, and remember not his (her) former iniquities and excesses, which he (she) has fallen into, through the violence of passion and the corruption of his (her) nature. For although he (she) has sinned, yet he (she) has always firmly believed in the Father, Son and Holy Ghost; he (she) has had a zeal for Thy honour, and faithfully adored Thee as his (her) God, and Creator of all things. Remember not, Lord, we pray Thee, the sins of his (her) youth, and his (her) ignorances; but according to Thy great mercy, be mindful of him (her) in Thy Heavenly glory. Let the heavens be opened to him (her), and the angels rejoice with him (her). Let the archangel St. Michael, whom Thou didst appoint the chief of the heavenly host, conduct him (her). Let the holy angels come out to meet him (her), and carry him (her) to the city of heavenly Jerusalem. Let blessed Peter the apostle, to whom God gave the Keys of the Kingdom of Heaven, receive him (her). Let St. Paul the apostle, who was a vessel of election, assist him (her). Let St. John the beloved disciple, to whom the secrets of Heaven were revealed, intercede for him (her). Let all the holy apostless, who received from Jesus Christ the power of binding and loosing, pray for him (her). Let all the saints and elect of God, who in this world have suffered torments in the name of Christ, intercede for him (her); that being freed from the prison of his (her) body, he (she) may be admitted into the glory of our Lord Jesus Christ, Who with Thee and the Holy Ghost, lives and reigns, world without end. Amen. May Mary the most merciful Virgin Mother of God, kindest comforter of them that mourn, commend to her Son the soul od this His servant (handmaid), that through her maternal intercession, he (she) may overcome the dread of death and, with her as guide, joyfully reach his (her) longed-for home in the heavenly fatherland. To thee I have recourse, St. Joseph, Patron of the dying; and to thee, at whose blessed death watchfully assisted Jesus and Mary, by both these dearest pledges I earnestly recommend the soul of this servant (handmaid) in the sufferings of his (her) last agony, that he (she) may by your protection be delivered from the snares of the devil and from eternal death, and may merit to attain everlasting joy. Through the same Christ our Lord. R. Subven�te, Sancti Dei, occ�rrite, Angeli D�mini, Suscipi�ntes �niman ejus, Offer�ntes eam in consp�ctu Alt�ssimi. Susc�piat te Christus, qui voc�vit te, et in sinum Abrahae Angeli ded�cant te. Suscipi�ntes �nimam ejus, Offer�ntes eam in consp�ctu Alt�ssimi. R. Come to his assistance, all you Saints of God: meet him, al you Angels of God: receiving his soul, offering it in the sight of the Most High. May Christ receive you, who hath called you, and may the Angels conduct you to Abraham's bosom. Receiving his (her) soul and offering it in the sight of the Most High. V. R�quiem aet�rnam dona ei, D�mine, et lux perp�tua l�ceat ei. Offer�ntes eam in consp�ctu Alt�ssimi. V. Eternal rest give to him (her), Lord: and let perpetual light shine upon him (her). Offering it in the sight of the Most High. [Pater noster (silently)]... Lord, have mercy. V. Et ne nos ind�cas in tentati�nem. V. ...and lead us not into temptation. R. Sed libera nos a malo. R. But deliver us from evil. V. R�quiem aet�rnam dona ei, D�mine. V. Eternal rest give to him (her), Lord. R. Et lux perp�tua l�ceat ei. R. And let perpetual light shine upon him (her). V. A porta �nferi. V. From the gates of Hell. R. Erue, D�mine, �nimam ejus. R. Deliver his (her) soul, Lord. V. R�quiescat in pace. V. May he (she) rest in peace. V. D�mine, ex�udi orati�nem meam. V. O Lord, hear my prayer. R. Et clamor meus ad te v�niat. R. And let my cry come to Thee. V. D�minus vobiscum. V. The Lord be with you. Or�mus. Tibi D�mine, commend�mus �nimam f�muli tui (f�mulae tuae) N.____, ut def�nctus (def�ncta) sa�culo tibi vivat: et quae per fragilit�tem hum�nae conversati�nis pecc�ta comm�sit, tu v�nia misericord�ssime piet�tis abst�rge. Per Christum D�minum nostrum. Let us pray. To Thee, Lord, we commend the soul of your servant (handmaid) N.____, that being dead to this world he (she) may live to Thee: and whatever sins he (she)( has committed in this life through human frailty, do Thou in Thy most merciful goodness forgive. Through Christ our Lord. Grant, O God, that while we lament the departure of this Thy servant (handmaid), we may always remember that we are most certainly to follow him (her). And give us grace to prepare for that last hour by a good life, that we may not be surprised by a sudden and unprovided death, but be ever watching, that, when Thou callest, we may, with the Bridegroom, enter into eternal glory: through Christ our Lord. Amen. Throughout the remainder of our lives, we pray for our dead.